A cost takeout strategy can take many shapes and forms. At Group50®, we have been reducing cost inside of businesses for many years and have consistently generated double digit reductions in cost takeout projects we have completed. 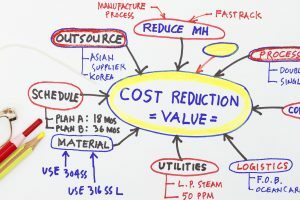 The critical issue in front of senior leadership is to define the scope of a cost takeout strategy. It is the equivalent of picking your battle. The choices can run the gamut from focusing on a single business process or product, to a “Wall to Wall” cost takeout initiative that looks at every aspect of the business. Cost takeout with a broader scope is often referred to as a business transformation. Each cost takeout project will have a unique set of objectives, implementation roadmap and change management strategy. Taking cost out is easy, but taking cost out without jeopardizing the business’ short and long-term performance requires a systematic approach. Identify the minimum cost to operate these elements and build upon that cost structure to support the business’s strategic needs. Upon completion of the analysis, the difficult work of making recommendations and creating the cost take out roadmap begins. It is important that this phase is properly facilitated with the senior leadership team, because they will need to make decisions about the acceptability of various impacts to internal and external customers. Once these decisions are made, the change management strategy is critical to the success of the implementation. A full cost takeout activity was done on a $210M division of a multi-billion consumer product company. Redesigned critical business products, relaunched ERP from batch processing to flow manufacturing, redesigned the core product offering and realized a $30M operating profit improvement. See the business case here. Other examples can be seen here. Call a Group50 cost takeout expert at (909) 949-9083, request more information here, or drop us a note at info@group50.com. Should IT Infrastructure be in your Top 3 business priority? Does Your Business Have a Robust Social Networking Strategy?